We grow soil. We're a soil factory. We treasure soil and our every effort is geared to make more. We mulch like our lives depend on it. (Err..guess they do, really). We grab every chance to add organic matter to the earth, and it repays us in spades. Well, not really in spades. That would be wierd. And anyway, we don't dig. But it repays us in fabulous water retentive, crumbly, climate resilient, fertile happy black stuff writhing with worms and a million billion microbes. We make compost in every available space. We have multiple compost heaps, bays, banks and piles. We create lasagne beds using layers of cardboard, horse manure, garden prunings, grass, straw and our own compost, all of which, like magic, turns into new, gorgeous soil. We almost never dig. (Digging can damage the soil structure, release carbon and activate weeds). 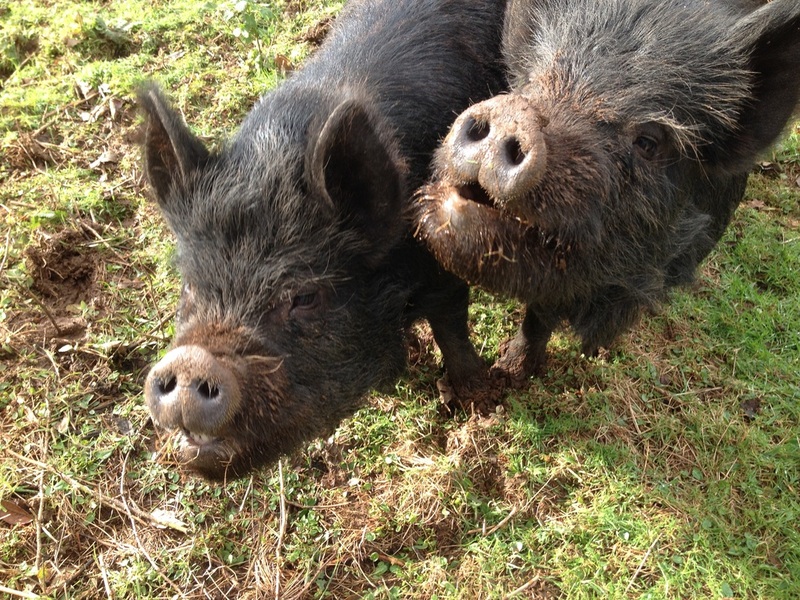 We have two pigs (Aristotle and Mrs Pankhurst) whose sole job is to keep the bracken and bramble down, and to poo. Pig poo is first class organic matter. Organic matter is the top notch, no exceptions, absolutely favourite thing of soil. It cures all soil ailments. It improves water retention, gives structure, adds air, water, and nutrients, evens out extremes of soil types, and gets things growing. And if we just all put a bit more organic matter in our soil instead of this toxic brew of fertilisers and pesticides, all made with fossil fuels (duh), then we might not keep losing it at twice the speed we need to create it to feed us all. The map on the right is what the UK looked like in Feb 2014 after a storm. All that brown stuff getting washed into the sea (including polluting pesticides, herbicides and fertilisers)? Our soil. ​"The nation that destroys its soil destroys itself." CoaST ReBoot: Positive Soil. from manda brookman on Vimeo. This is a fab wee clip showing some of the secrets of our soil - the place where one third of all living organisms live, and we have barely even begun to understand it. I did this for a programme called ReBoot recently, helping tourism businesses who knew about tourism but not much about soil - and who wanted to learn! We use no fossil fuel based additives -that means we use no artificial fertilisers or pesticides. We compost just about everything we possibly can: chicken bedding, paper, cardboard, food scraps, garden waste. We grow our seedlings in our own compost, and add it as mulch to our soil. We use No Dig systems. That means...we don't dig the soil. We add to it, instead. We use straw, compost, cardboard, bracken and wood chippings as mulch. Did we mention that we mulch everything? We grow mineral accumulators - ie plants that brings up really fab nutrients from deep in the soil, into its stem and leaves, like comfrey, and elaeagnus. We can then use them as mulch and then "chop and drop" - cut it back and leave it on the soil, to let the leaves the be taken back into the top soil by worms and other Soil Super Heroes. 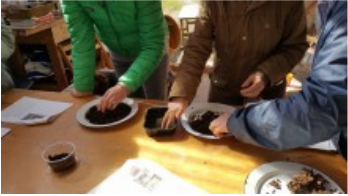 We use coffee grounds, broken egg shells, beer, straw and "wool" pellets to dissuade slugs. And we go out every night after dark and remove them from our plants by hand. That's how important we think it is not to poison the soil. Oh, and the chickens love 'em for breakfast. In one handful of soil, the size of a cricket ball, the living system supports a hundred billion bacteria, and tens of k/meters of fungal growth. Most of this is microscopic - mites, protazoa etc. The fuel for this extraordinary organic engine which is fundamental to life on earth is organic matter. Structure is important - but without organic matter, the engine stops. There are 50,000 different types of soil across the world. It contains one third of all living organisms, but is possibly the least understood eco-system on the earth. We can replace the chemistry and the physics - and we can't replace the life.